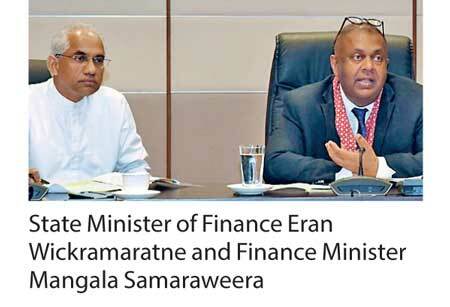 One of the main proposals made in the Budget to create entrepreneurs will be launched in March, Finance Minister Mangala Samaraweera said yesterday, with the possibility of awardees being given an interest subsidy up to 75% of the effective interest rate. The Government expects to disburse Rs. 60,000 million through state and private banks to would-be entrepreneurs and another Rs. 5,000 million has been set aside by the Treasury to reimburse the interest subsidy to the banks, the Ministry said in a statement. Under this scheme 15 different loan schemes have been proposed for young entrepreneurs in the fields of agriculture, fisheries and small and medium enterprises. This scheme includes journalists and those who are self-employed as well. “In addition to young entrepreneurs, women and differently abled persons will also be provided with a special opportunity to take part in this program. Women and differently abled persons who come forward to take part in this program will be offered additional interest subsidies of 10% and 15% more respectively,” the statement said. The women will have to form a company at least with 10 equity shareholders and each shareholder will have invested at least Rs. 10,000. The Government will extend a comprehensive support package which includes both non-financial and financial assistance including grants and credit through the enterprise Sri Lanka credit schemes to these companies. The Minister called upon all the banks to extend their fullest support to implement this program of the Government, to create new jobs through the expansion of the economy while aiming to expand exports. The Government expects the SME sector to be the backbone of the economy. However, the lack of capital or the difficulty in accessing capital due to both the cost of capital and the requirement for collateral have been the main impediments in the development of startups and SMEs. However, the Minister stated that the Government’s objective was to ensure that no entrepreneur was ever denied credit due to the lack of collateral but was able to access financing given the viability of the project proposals. The heads of state and private banks assured the Minster of their continuous support of this project to realise the Government’s objectives of creating one million new jobs, increasing per capita income and expanding exports through the Enterprise Sri Lanka program. When attempting to expand the small and medium-scale business sector, including self-employment, the Minister informed the bank officers that the Government would not allow banks to repay loans because of the impossibility of obtaining capital costs and loans. As the Treasury has decided to hereafter hand over the bails which are expected by the banks from businessman by considering only the feasibility of the project proposal, the Government has decided to issue a Treasury bail for debtors to issue loans on a concessional interest basis. With the aim of increasing female participation in the field of business and industry, women who join the Enterprise Sri Lanka program will be given an interest relief of 10% in addition to the 75% interest relief received when granting a loan and 15% extra (surplus) interest relief for specially-skilled individuals with a Treasury bail will be provided by the Government. The Government will provide non-financial technical facilities for the companies, to which women will have a greater entitlement, including at least 10 participants that start with a minimum capital of Rs. 10,000 from each shareholder. The Government will hold 75% of the leasing cost of the machinery under the leasing method by such companies and the Treasury will issue the required bail for the relevant banks.